Traditionally a forklift OSH certificate course has involved a theory session in a classroom with other students followed by a short practical assessment. The operator is often away all day then comes to work the day after. 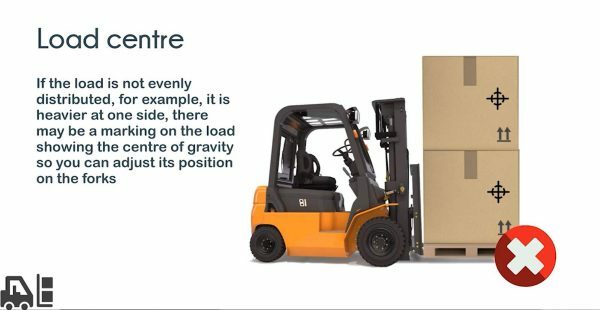 This approach is not suitable for a large number of forklift operators, it is not convenient for companies and there are reasons why it does not provide the best learning approach to a topic concerning a dangerous piece of machinery in the workplace. 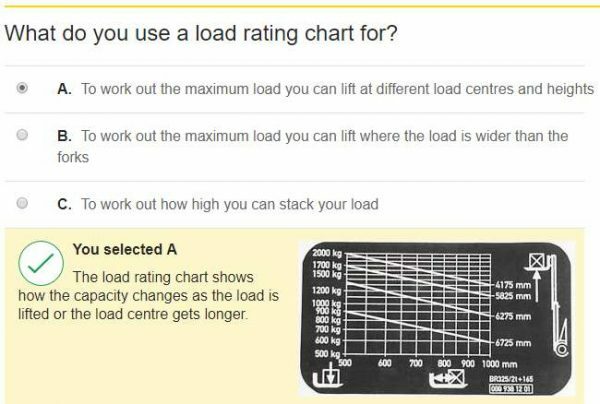 Why is forklift e-learning better than classroom learning? The average attention span is 20 minutes, but the average theory session in a forklift OSH certificate course is over three hours. An operator will typically retain 8-10 things from a learning session, regardless of how long it is. Therefore, if you break the course down into shorter sessions (our modules take between three and 13 minutes) and spread that learning over several days, they will remember a larger portion of what has been taught and they can immediately apply that in the workplace on the day of learning. If an operator does not understand all the concepts presented or they get some of the questions incorrect, they can simply repeat the module until they understand it, something that is not possible in a group classroom situation where operators can be embarrassed to put their hand up to ask. Because the material is presented in a visual and auditory way with a kinesthetic response via answering questions after each video, it can achieve more depth in a quicker time. Concepts are explained using diagrams, animation and video with accompanying voiceover reinforcing text on the screen. E-learning allows concepts to be presented in multiple ways that are more memorable. Most forklift trainers are good, but everyone has occasional bad days where they are feeling under the weather. Having material online means that the operators see information that is presented the same way every time. All operators are tested using the same materials. It’s more difficult for an operator to disengage as they have to answer the questions at the end of the videos, whereas in a group of 8 other operators they might just be asked a few questions and, if they don’t know, the trainer will often just give them the answer. Giving them the answer creates zero engagement. If your forklift operators are on night shift, it’s not always convenient for them to do a daytime course as they will be tired. 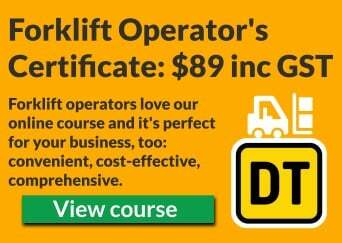 If your forklift operators are generally busy all day but with short periods of downtime while they are waiting for new tasks, an online course provides a great opportunity for the operator to go through one or two modules, rather than a supervisor or manager having to find a whole day where the operator can be off-site. The course material can be completed on a smartphone, tablet or computer, and modules can be taken in any order. You can instantly enrol in an online course; there’s no waiting for an instructor to become available. Our forklift course has in-page translations for the questions into over 100 different languages. 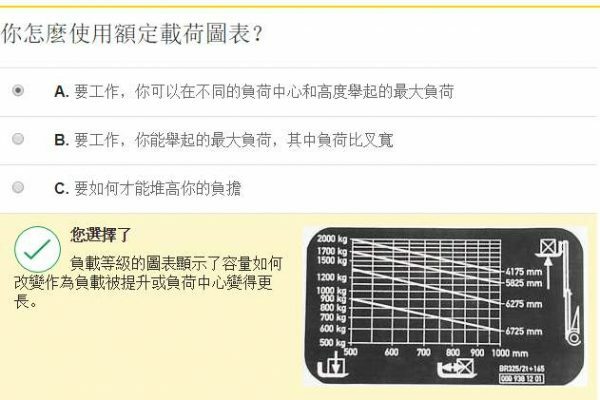 This means that a person can translate a question they are not sure about into a language they are more familiar with as you can see with this English question that has been translated in-page to Chinese. All questions have an audio recording to help those with English literacy difficulties (such as dyslexia or poor reading skills), plus text on-screen is reinforced with voiceover. This is good not only for native English speakers but also those who have English as a second language who might speak English very well but don’t read it very well. The course materials are available online for up to 12 months which means that an operator can go back and revise modules if they need to. It means that if a supervisor sees a forklift operator developing bad habits, they can encourage them to repeat modules that reinforce good habits. The length of time the course takes to complete will depend on the skills and learning ability of the operator. Experienced operators will breeze through it in 1.5-2 hours, while new operators might take 2.5 hours. With an external course of people with mixed abilities, everyone has to go at the pace of the slowest learner which is frustrating for those who are familiar with the material. 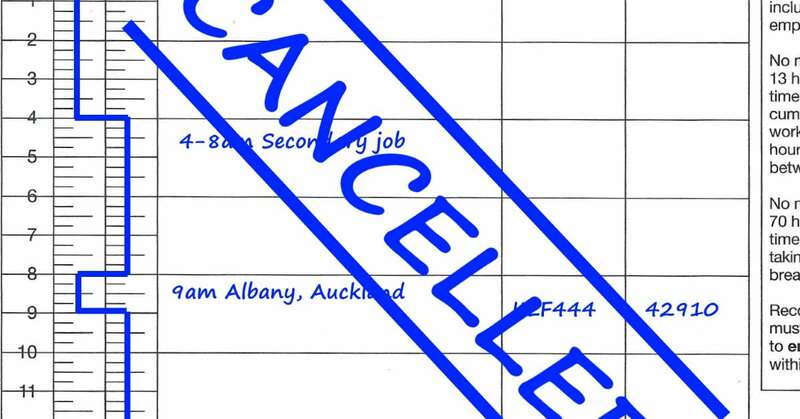 Add up the cost of your operator being off-site for a day plus the cost of an external course and it gets expensive. An online forklift course can be fitted into an operator’s work week as shorter time periods can be scheduled to finish the modules when it’s convenient for the operator. The online course materials are also cheaper than having a trainer deliver the material. As the practical assessment can be conducted in-house using the guide, supervisors and managers know exactly what the operator should and shouldn’t be doing, giving them more control over the health and safety processes in their workplace. The practical assessment can be modified to suit the operator’s actual work. Supervisors and managers can track an operator’s progress through the course and download their results. For the forklift operator’s certificate, you are not required to have a Competenz-approved assessor assess the practical or theory for the course. Following the guidance of the Health and Safety at Work Act 2015, a company could take full control over training and induction for its operators so that it can be certain that the training meets its requirements and is consistent with its objectives. A supervisor, who can be an experienced operator, a health and safety expert or a person responsible for training, can follow the practical guide (downloadable checksheet + video) supplied in the course to ensure the operator is competent on the day and sign them off within the e-learning software. In fact, this is what a supervisor should be doing every day – checking that the operators are operating forklifts correctly! This video gives a good overview of the content and the style of delivery. Please fill in the form below if you would like a demo. Demonstrations usually take around 30 minutes and we will show you some of the content and explain how the system works.